Brand new Selfie Drone for sale at Ezusbuy.com. The Awesome New 720p Baby Selfie Drone is selling out fast!! 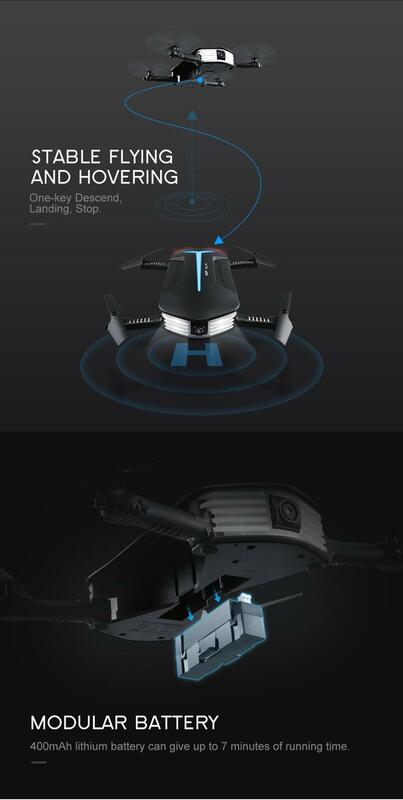 This improved new drone comes with a remote control or you can use your cell phone to control the Drone as well! Paczka źle zapakowana, opakowanie zmiażdżone. Na szczęście nic nie zostało połamane w środku. Przy pierwszym uruchomieniu dron lata. Trzeba się jeszcze nauczyć sterować. good arrived. drone works well. i'm very satisfied!! Absolutely correct with specification. Working brilliant!! 5/5 Thank you! Working Good. I will test now. Nicely packaged and very fast shipping, I haven't used it yet so will see. Pros: EXCELLENT storage bag, sturdy drone (took a few fall & still works fine), the G-sensor controller is very precise and easy to use, headless mode is useful, camera quality is average. Cons: Very light weight (moderate-heavy winds will affect flying), This is the best drone with cam that you can get under $180. This is a really fun mini drone! Well, first off, this is a pocket drone so it was actually smaller than I thought from the pictures. I was able to charge up the battery with the included USB adapter. Would have been nice if the battery accepted micro USB input. After downloading the app, I was able to pair up the drone and my phone and within 10 minutes I had it flying all around the yard. Range is pretty good. Flying time was just under 10 minutes so I might suggest getting some backup batteries that were also pretty cheap. Pictures are pretty sharp. I had some issues with the video, but that might have been my phone acting up so I'll have to test that part later. For the money, I think it's well worth it and a lot of fun. COOL PRODUCT! We've heard a lot about drones and being available in the marketplace, however, this is the first drone that I've ever owned and I'm super pleased and excited with it. -it's a great gadget to keep kids entertained and to keep myself entertained -The look and feel of it is actually pretty nice -you'll be the envy of all your friends and neighbors -you need to play around with it to get the hang of it -easily download it onto your phone and control it from there - The images you get from the camera or not bad -I have a few trips coming up that love to be able to use this in the open landscape, but I'm going to practice in my backyard before I do, so I can have good control and know it's limits -I can imagine if you have teenagers or young individuals who are excited about technology this will also make a really, really cool gift :gift:! very fast shiping thanks! great quality. EVERYTHING-very good state, information delivered corresponds figment pointed. very good selling. excellent product, it came's very good. Very fast Thank you 5 star. loot thanka a very good stuff .. the buyer will again! good It's arrived in two weeks, but I still like it. Use it well. fast shipping מאד. ok skimmer והשימוש בסנסור really comfortable וכייפי and can adjust well for young children. relative נגמרות batteries fast, but it normal. highly recommend. Nice small drone, flies very well! Recommended seller. Got my baby elfie, works perfectly. Very good quality, super fast shipping, recommended seller. nice! great little quad! quick ship! recommended seller!